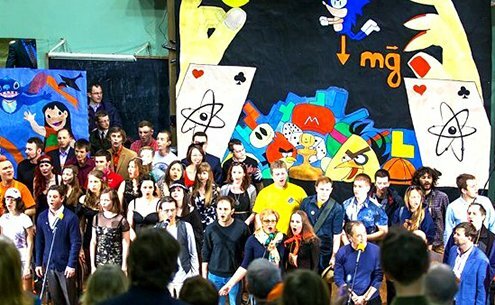 In early April, our company became one of the organizers of the fun-filled, colorful, and long-awaited fest for all students of The Faculty of Physics of St. Petersburg State University — The Annual Physicist’s Day. Within a week from April 7 to 12, students, teachers and friends of the Faculty took part in the intellectual, sports and entertainment competitions and quests, enjoyed performances and shows, took parts in meetings and conferences. Our responsibility was the technical support of the event: the production of posters, banners, props for festive decoration, calendars, and other printed products. Scarves, T-shirts, and sweatshirts will warm and remind participants of fest. Coffee breaks, which were held by us, helped students to get refreshed, while the souvenirs — made this holiday unforgettable. The high note of the celebration was the fireworks organized by us specifically in honor of future Einstein and Curie.